Blueberry is the member of Berry family. Blueberry is full of antioxidants which can helps reduce the risk of some cancers. Here we will make blueberry jam at home without preservatives like Citrus acid. And it will taste awesome and better than store bought. This is a very easy recipe to make and easy to store for long days. Blueberry is the member of Berry family. Blueberry is full of antioxidants which can helps reduce the risk of some cancers. Wash the blueberries and rinse well. Now take a saucepan and mix add Blueberry , Lemon juice & sugar at a time and give a nice stir and put the pan on medium heat. Now let the Blueberries melt with the sugar and stir them all together well. The Blueberry mixture will start boiling. Let the mixture a hard boil, stirring continuously. Boil the mixture till it becomes jam like consistency. When you will be satisfied with the consistency turn off the oven and let the mixture cool down to room temperature. 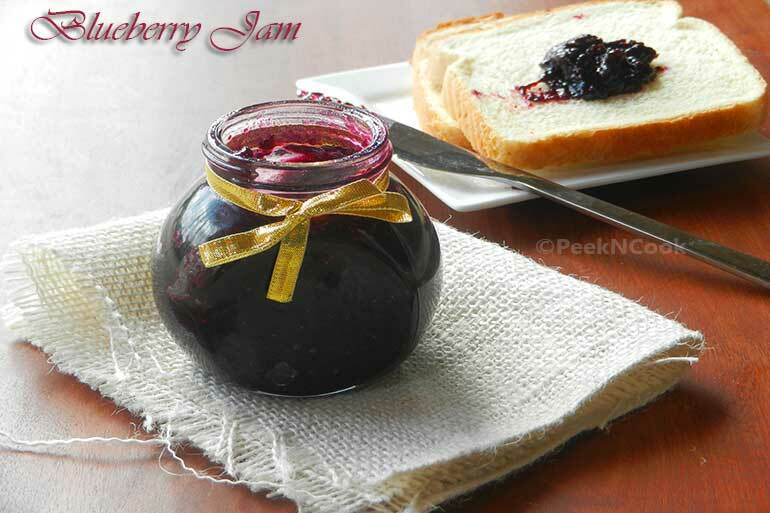 When it will meet the room temperature pour into a jar and keep refrigerated and use the Homemade Jam for 2-3 months.